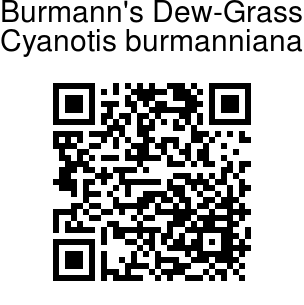 Burmann's Dew-Grass is a small herb with stem prostrate, sparsely hairy. Flowers are pale blue, sepals up to 5 x 1.5 mm, lanceshaped, united at base, hairy along margin; flower tube 4 mm, petals lanceshaped; filaments bearded. Flowers are borne in stalked cymes at branch-ends and in the axils of upper leaves. 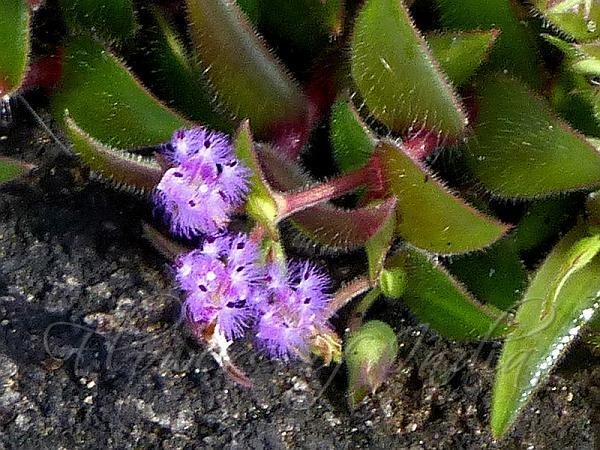 Bracts are 9 x 4 mm, broadly ovate, tapering, bracteole to 8 x 3 mm, wedge-shaped, fringed with hairs, 4-8 pairs in cymes. Leaves are 2-4 x 1.5 cm, lanceshaped, tip pointed, sparsely hairy on both sides; sheath up to 1 cm. Capsule ovoid, seeds yellowish-brown. Burmann's Dew-Grass is endemic to Western Ghats. Flowering: August-December.